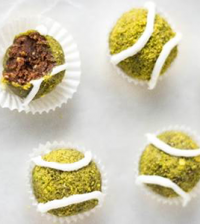 This week here at Sportsister we’re hosting our very first Tennis Week. Wimbledon begins today and the sport will no doubt be taking over many of our lives for the next fortnight. And with so many British names amongst the line up this year including Laura Robson and Heather Watson, Britain’s number one and two respectively, we thought it was the perfect time to get you fully up to speed with all you need to know about the game. Tennis can be played either by two opposing players (singles) or by two teams of two players (doubles). In a women’s or mixed match, players aim to win the best of three sets. When a player/duo wins six games they have won the set, provided they are two games clear of their opponent. A set can also be won by 7-5, but if 6-6 is reached then a tie-breaker must be played. All that sounds very complicated, but in reality tennis is a simple net and ball game; keep the ball inside the lines of the court and away from the opposing player and you’re pretty much set (pardon the pun). 0 points = love, 1 point = 15, 2 points = 30, 3 points = 40, 4 points = game. If both players have scored 3 points each, i.e. 40-40, this is called deuce, and a player must score two consecutive points to win the game. Who can play? Do I need to be very fit? The beauty of tennis is that anybody can play. From your six-year-old niece, to grandma and grandpa, everybody can get involved. Of course it depends on the level that you wish to play at, but if tennis is just a social outing with friends for a knock-around, then a high level of fitness isn’t required. But if you’re really serious about getting into the game at a competitive level, then a reasonable fitness level will be needed. Asking how long a tennis match lasts is akin to ‘how long is a piece of string?’ – it can be hours! No matter where you are in the UK, there will be some sort of tennis facilities in and around your area. 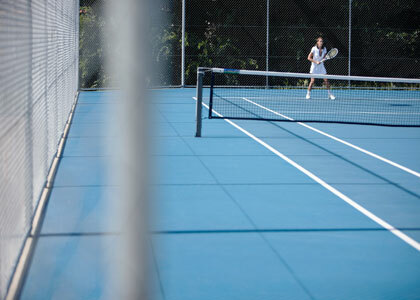 There are thousands of public courts available for use free of charge; some do have a time-limit if others are waiting to play so make sure you check before you start. Note that there may be longer waiting times in late June, early July, when every year the nation gets gripped with tennis fever during Wimbledon. 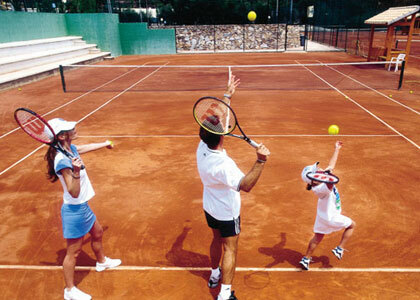 Tennis Clubs are another option, in particular for those wanting to play the game at a more advanced level. For a yearly fee, tennis facilities will be open all year round. Clubs are great for socialising, with opportunities to meet and play with people of a similar standard. 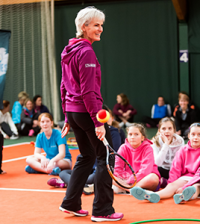 Another benefit is that they will have a tennis coach on hand if you want to seriously improve your game. They will charge a fee, but it’s worth it – coaches really do work! And don’t forget, if you can play tennis, you can play tennis anywhere. It’s a great social asset, and a good way of meeting new people, whether you’re moving school, house or simply going on holiday, there’s no better way to break the ice than with a game of tennis! Is it expensive? What do I need? The straight forward, but perhaps not totally helpful answer is that it can be as expensive or inexpensive as you want it to be. All that is needed is a friend to play with – hopefully they won’t charge – a racket, a ball and a tennis court. Why not enter our fab competition to win a complete tennis bundle and then it won’t cost you a thing! Tennis rackets can be purchased from most major sports-shops, and range in price from around £20 to between £200 and £300. Both Wilson and Head do a great range of women’s rackets, which can be purchased from sport-shops or online. www.prodirecttennis.com has a great variety, both in style and in price. Of course if you are playing in a public park, you can wear what you choose, but just be aware that if you intend to join a tennis club, they may insist you wear whites. Tennis clothing is easy to come by, and relatively inexpensive. Visit www.sheactive.co.uk, www.sweatybetty.com, www.elliegrey.com or www.sportswoman.co.uk for the best selection. One sports bra does not fit all. 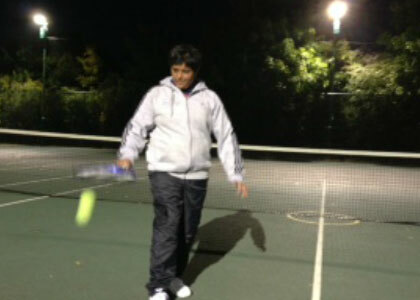 For racket sports, women need more support to counter the extra lateral movement. Shock Absorber makes a Racket Bra, designed to reduce movement when serving, lunging sideways and rotating the body. The straps are made to adjust easily and give more freedom to move the arms. The Shock Absorber Racket Bra can be purchased at www.shockabsorber.co.uk. Investing in a pair of tennis shoes is also worthwhile if you plan on playing the game seriously. K-Swiss feature an extensive line of tennis footwear from the basic to extra support and traction for multi court surfaces. See what’s in stock at www.kswiss.com. So if you play on a free of charge public court, with a very basic racket, then a game of tennis will cost you next to nothing. On the other hand, if you join a club, buy a top of the range Wilson racket and kit yourself out like Maria Sharapova, then you could be looking at a hefty credit-card bill. We’ll leave that up to you! Serve: Every point is started with a serve. The server has two chances – a first serve, then a second serve – to hit the ball over the net and into the service box which is situated diagonally across from them. Ground Strokes: The posh term for ‘forehands’ and ‘backhands’. The most commonly used shots in tennis, these are when the ball has bounced once, and is hit back over the net. Volley: Again can be hit on the forehand or backhand side, but this time the ball is hit back across the net before it has bounced. This shot is most effectively executed when close to the net. Overhead smash: If the opponents return is high, and close to the net, an overhead smash would be played. The technique used for the smash is very similar to that of the serve. Lob: A lob is when the ball is hit high, above the opponents head. It’s most effective when the opposition is at the net – often after they have played, or are preparing to play, a volley. Rally: When any combination of the above shots are executed between the two players, and the ball is kept in play. 3. Try and keep fit, this is a huge part of the game! 4. The serve is the hardest part of the game, practice this in your spare time as much as you can as you can do this on your own! 5. Tennis is a very mental game. Develop some confidence off the court and a recommended read would be “Winning Ugly” by Brad Gilbert. 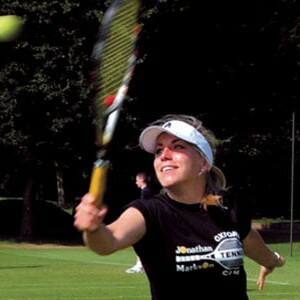 www.lta.org.uk – The home of the Lawn Tennis Association – the governing body for tennis in Great Britain. It houses all the information for tennis players in this country. www.aegontennis.co.uk – Tennis site for AEGON who sponsor the LTA and AEGON Parks Tennis grassroots programme to increase access to tennis in parks and communities in the UK. 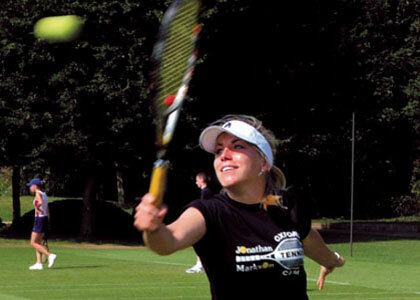 www.sonyericssonwtatour.com – The official home of the Women’s Tennis Association. It has all the latest news, results and player rankings from the Sony Ericsson tour. www.wimbledon.org – The official website of the Wimbledon Championships. The 2011 competition will be held June 24 – July 7 2013. Throughout Wimbledon this summer, Virgin Active are opening up their tennis facilities to all non-members for free, to encourage families to take up tennis.